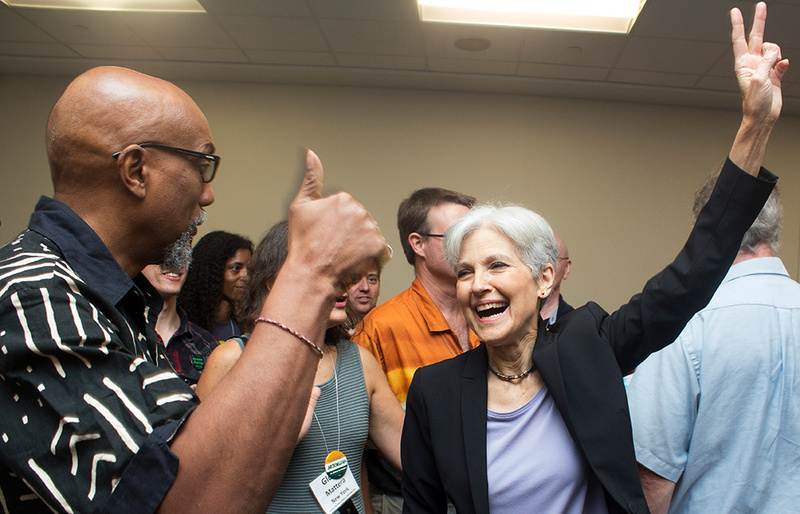 Jill Stein and Ajamu Baraka’s 2016 Presidential campaign was the Green Party’s most highly visible campaign since Ralph Nader and Winona LaDuke first brought the Greens to national prominence in 2000. The Stein/Baraka ticket won 1,457,226 votes, 1.1 percent of the 2016 total. This was the Greens’ highest share of the Presidential vote since 2000, when Nader and LaDuke earned 2.74 percent with 2,882,955 votes. Although Stein and Baraka didn’t get to paint the White House green, their campaign both set the party on a course for growth, and challenged it to harness the momentum of a national election. In May of 2016 there were 216,200 registered Greens in the United States, a 15-year low. By August 2017, the number was 257,389, a growth of 41,189 or 19 percent. The Green Party is America’s 4th-largest party, after the Libertarians, and the largest that doesn’t accept corporate money. While still small compared to the Democratic and Republican parties, the Green Party’s recent growth demonstrates a staying power that few national parties have achieved in the US. In 2017 the Green Party had the most candidates running for office in an off-year election in 12 years. With 44 Greens getting elected it brought the total number of Greens in office to 137. Two State Representatives in Maine joined the Greens this year, a new landmark for one of the first state parties (see article page 6). Many candidates who didn’t win nevertheless made a big impact, such as Jabari Brisport, who set a new rec­ord for a Green running for New York City Coun­cil with 29 percent against an established Democratic incumbent (see article page 8). Hard work and campaign donations put the Stein/Baraka ticket on the ballot in 44 states and Washington DC, and earned write-in status in 3 additional states. Only 3 states did not allow a Green vote for President. This was the closest Greens have yet come to achieving national ballot access in the face of discriminatory ballot access laws. With the help of the presidential campaign, state Green parties retained ballot status in 21 states. Since then, Utah Greens have gained ballot status and North Carolina has lowered its requirement from 94,000 signatures to 12,000, making it likely that Greens will soon get on NC’s ballot for the first time in history. The Green Party’s Ballot Access Committee is working to add additional ballot lines in 2018, including states like Nevada and Indiana where Greens missed the ballot in 2016. New state parties have come online in states where the party hadn’t been active before 2016, including Utah, Montana and Nevada. Greens in Missouri, previously split between the Progressive Party and a St. Louis chapter affiliated with Green Party USA, have reunited as the Missouri Green Party. Many established state parties have experienced an influx of both new members and reactivated veteran members. The 2016 campaign was particularly successful at using social media to bypass the gatekeepers of corporate media and reach the public directly. On the national level, the Green Party of the United States now employs 5 staff members: an office manager, web manager, media director, fundraiser and national political organizer. Although several state parties employ at least one part-time staffer, both the state and national parties remain overwhelmingly volunteer-driven organizations. The national party has 5 accredited caucuses: The Women’s, Black, Latinx, Lav­ender, and Youth Caucuses. Indigenous and Disability caucuses are in the process of forming. The Youth Caucus has experienced particularly solid growth, with close to 200 dues-paying members on the caucus’ online forum, and an active presence on more than 50 college campuses and in almost every state, including states such as Alaska, Idaho, Oklahoma, and New Hampshire which otherwise have low activity or even no affiliated state party. While the national party doesn’t keep detailed fundraising records, the party has roughly 7,500 donors over the past two years, including 1,400 monthly sustainers. However, the party has not yet managed to harness the fundraising potential tapped by the presidential campaign. A November 2016 ballot access email acknowledges: “We are entering a key election year, yet we have remarkably low financial reserves and are facing cuts to our party’s proposed budget across the board.” This raises critical questions about what steps the party must take in order to sustainably fund a national organization. The Green Party’s media presence grew thanks to the 2016 campaign, which saw landmarks such as the first hour-long CNN town hall devoted to the Green presidential ticket. While much of the coverage was antagonistic and focused on how Greens threat­en the lesser-evilism of the two-party system, it nevertheless opened channels for independent thinkers to learn more about the party. The 2016 campaign was particularly successful at using social media to bypass the gatekeepers of corporate media and reach the public directly. This insurgent presence on social media demonstrated enough support for the campaign that the corporate media had to grant at least a small amount of coverage, if only maintain the illusion of an objective free press. In April 2016 Jill Stein joined the top trending topics on both Facebook and Twitter, and when interviewed live on Facebook by ABC News she shattered their previous record for viewership ten times over. Twitter has verified the accounts of the national party as well as 23 state parties and 2 caucuses, a new recognition of legitimacy from a social media platform that has become a high-profile venue in US politics. Other organizations on the progressive left have started to show an increasing interest in the type of independent politics championed by the Green Party. Democratic Socialists of America, which has drawn attention as the largest socialist organization in the US with over 30,000 dues-paying members, shares many goals with the Greens and supported a number of Green campaigns in 2017. Our Revolution, the organization founded by Senator Bernie Sanders after his Democratic primary run, even endorsed several Greens. Many Sanders supporters gravitated to the Green Party after the Democratic Party’s blatant efforts to deny Sanders its nomination, while others who initially considered forming a new party are deciding to go Green rather than reinvent the wheel. The historic unpopularity of the establishment parties’ 2016 nominees inspired a groundswell of support for systemic changes to the US political system. A September 2016 Suffolk University/USA Today poll found that 76 percent of Americans wanted the Green and Libertarian candidates in the presidential debates, although the people’s will was predictably overruled by the DNC/ RNC-controlled Commission on Presidential Debates. A September 2017 Gallup poll found that 61 percent of Americans — a record high — agree the Democratic and Republican parties do such a poor job representing the people that a new major party is needed. In Maine, 52 percent voted in 2016 to enact Ranked Choice Voting at the state level, the first statewide victory for the growing voter choice movement. Long years of dogged Green organizing played a critical role building up to this win, including campaigns for statewide office as well as the successful campaign to use Ranked Choice Voting in Portland, Maine’s largest city. Now Maine Greens are gaining momentum and members in the fight to defend Ranked Choice Voting from the bipartisan establishment, which quickly went to work to sabotage the people’s will. Jill Stein joined the top trending topics on both Facebook and Twitter, and when interviewed live on Facebook by ABC News she shattered their previous record for viewership ten times over. The 2016 campaign played an unmistakable part in revitalizing the Green Party, and inspiring new members, chapters and candidates across the country. It also revealed continuing challenges the party faces in harnessing the energy of campaign seasons to build the independent political force for people, planet and peace over profit that the current historical moment so urgently demands. 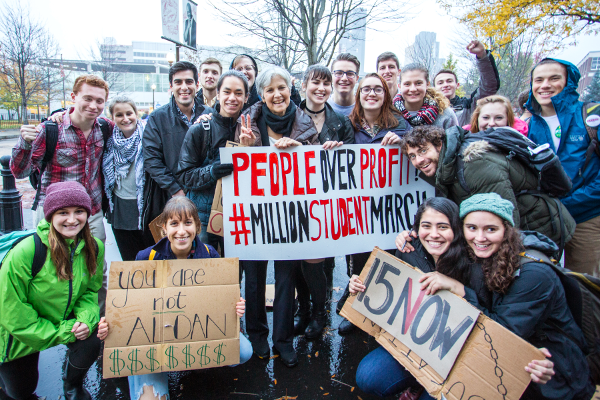 To break through the faltering two-party system to real power, Greens will need to engage in revolutionary self-criticism about how to organize a party that can mobilize the rapidly growing number of Americans who share the vision of a better world. Dave Schwab served as the Communications Director for the Stein/Baraka campaign, and now serves as a Co-chair of the Wisconsin Green Party. Jill announced at the Annual National Meeting in Salt Lake City this summer that she would not be seeking our nomination in 2020.